Integration of the new VDE 8.2/8.3 lines into the Leipzig hub will entail reconstruction of the entire Leipzig Hauptbahnhof station throat, involving the removal, relaying and new construction of track and installations. See below for a diagram of track to be laid in the station throat. Within Leipzig Hauptbahnhof itself, platforms 10 to 15 will be extended. Platforms 10 and 11 will be rebuilt to a standard length of 370 m and platforms 12-15 to a standard length of 420 m. Allowance has been made on platforms 12-15 for the extra length required for joining and splitting trains and for a scheduled train length of 415 m in setting track and platform length. Platforms 10/11, 12/13 and 14/15 at Leipzig Hauptbahnhof will be rebuilt to the planned standard lengths. The standard length of platforms 10/11 is 370 m. The existing bay platform 10a will be removed and not replaced. The two other platforms will be rebuilt to a standard length of 420 m. Platforms 10 to 15 will be built out from the concourse at a height of 76 cm above the running surface of the rail. The platforms will be of conventional concrete construction (backfilled prefabricated concrete beams). The new surface will contain the guide system for the blind and visually impaired. The signposting system and platform fittings will also be upgraded and adapted. 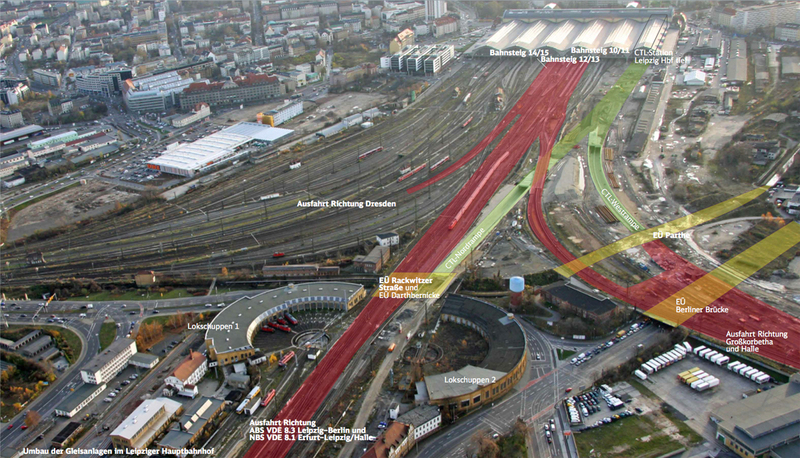 Implementation of the above track plan and provision for the demands of the commission, including the desired finished state, entails extensive rebuilding work in and around Leipzig Hauptbahnhof. As well as the relaying and new construction of track, extensive track demolition work will be necessary, not only because of the track plan, but also within the scope of site clearance work. The exit towards Dresden constitutes a further major rebuilding area. Long-distance trains crossed the station throat through a tunnel to reach the Dresden line until September 2013. This tunnel will now be filled in and the Dresden line moved on to the surface during a fourteen-day blockade in September 2014. Standard permanent way under Directive (Ril) 820.2010 "Standard for ballasted permanent way" is anticipated for new and replacement track and points, i.e. 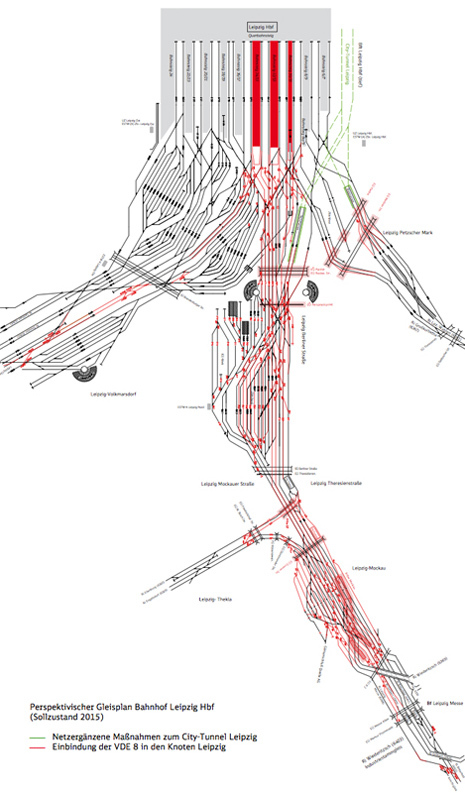 the new track will predominantly be permanent way class W 14K–54–B or W 14K–60–B. The new points to be installed will use S54 or UIC 60 rails on concrete sleepers. Points with S49 rails are intended for track with a light load. UIC 60 rails will probably only be used for the track and points on lines 5919 (new) and 6411 (upgraded) about as far as Theresienstrasse halt and possibly also for the track on line 6363. The ballast will be completely replaced throughout the entire rebuilding area, in which the use of cleaned (old) ballast is permitted for track and points. All the lines in the rebuilding area will have the standard cross section. i.e. the material weighs approximately 54 kg per linear metre. B: The rail is fastened to concrete sleepers. 60: The rail laid is UIC 60, i.e. the material weighs about 60 kg per linear metre.